1. Start by leaving the butter out to come to a room temperature. Do not melt the butter in the microwave, for that will separate the oils and fats in the butter and will result in a buttercream with a texture similar to cottage cheese. 2. Cream the butter until it is light and fluffy. Then begin to add the powdered sugar a spoonful at a time. The amount of powdered sugar I wrote above is just a suggestion. Not much sugar is needed since the marshmallow fluff is very sweet. You can always add more sugar after you've mixed in everything. 3. Mix in the whole container of marshmallow fluff. Keep mixing until everything is combined. 4. Add your favorite extracts and seasonings. This frosting is super versatile. 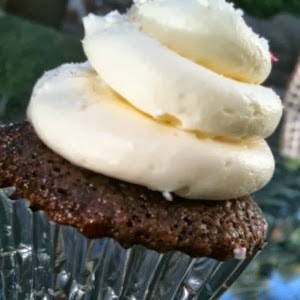 My personal favorite is peppermint extract which gives a light and refreshing flavor to the fluffy frosting. 5. Depending on what your use for this frosting is, you may want to add some milk into the frosting to thin it out. I have noticed that the frosting can tend to be on the thick side without the milk. Take care to add only a few drops of milk at a time, for you don't want a gloopy mess that's too thin to frost.